Centrul Ceh este co-organizator al Festivalului Internațional de Orgă Sf. Iosif, unde va participa și organistul ceh Pavel Kohout duminică, 27 mai 2018, de la ora 19:30. Întregul festival are loc în perioada 25 mai – 31 mai 2018 în Catedrala Sf. Iosif. The Czech concert organist Pavel Kohout gained world recognition as a brilliant organ virtuoso for his exceptional sense of music, enormous technique and natural interpretation. Already in the age of 24, he became First Prize, Gold Medal and J. S. Bach Prize Winner at prestigious Int. Organ Competition in Musashino-Tokyo, one of the world´ s largest international music competitions, opening him all kind of concert venues, famous concert halls, universities, cathedrals, churches world-wide and is regarded today as one of the finest European concert recitalists. He won additional First Prizes at international competitions in Ljubljana 1995 and 1998, Vilnius 1999 and several other major prizes and diplomas at international organ competitions in Prague, Poznan, Kaliningrad, Brugges and Lübeck, including the “Dancing Angel” Prize awarded from the European Union of Music Competitions. 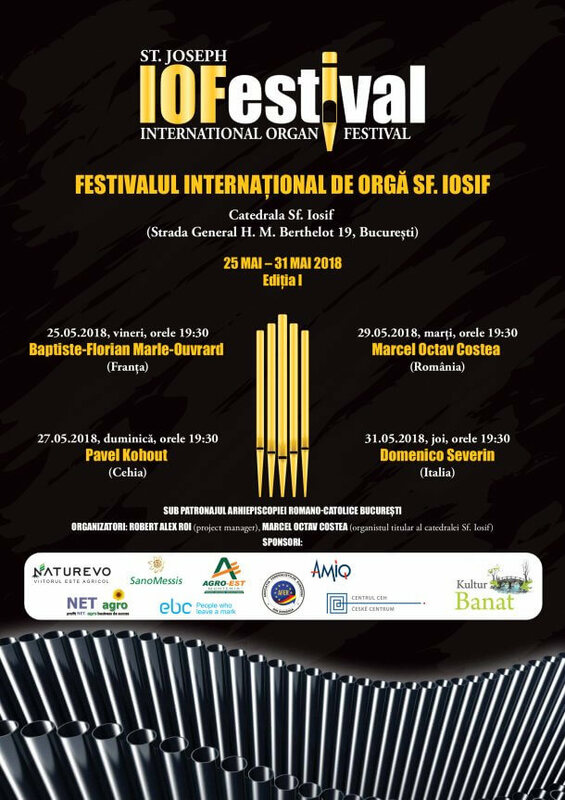 Pavel Kohout performs widely as solo concert organist, orchestra soloist in all countries of Europe, USA, Japan, South Korea, Australia and New Zealand, as well in many other countries like Hong Kong, Singapore, Israel, Russia, Georgia. He appeared on international music festivals in Praha, Bratislava, Bucharest, Munich, Frankfurt am Main, Paris, Moscow, Amsterdam, Haarlem, Zaragoza, Athens, Jerusalem, Sapporo, Tokyo, Auckland, New York City, Washington D.C., Atlanta, San Francisco, Los Angeles, Houston, including prestigious concert venueslike Berlin Concert House, Sydney and Melbourne Town Halls, Suntory Hall Tokyo, International House of Music in Moscow, cathedrals of Notre Dame de Paris, Bordeaux, Tours, Monaco, Genéve, Lisbon, Berliner Dom, Freiburger Münster, Stanford and Cornell University and many others. Pavel Kohout is a graduate of the Prague Conservatory (Jan Kalfus) and the Music Faculty of the Academy of Performing Arts in Prague, under the tutelage of Prof. Jaroslav Tůma and Doc. Anna Machova. He continued his studies in historical performance practice with renowned specialist Prof. Jacques van Oortmerssen at the Amsterdam Conservatory in the Netherlands. He has attended international master classes by Harald Vogel, Ludger Lohmann, Michel Bouvard, Olivier Latry. In 2010 he obtained degree doctor philosophiae in historical performance practiceof the South German and Czech baroque organ music at the Academy of Performing Arts in Prague. 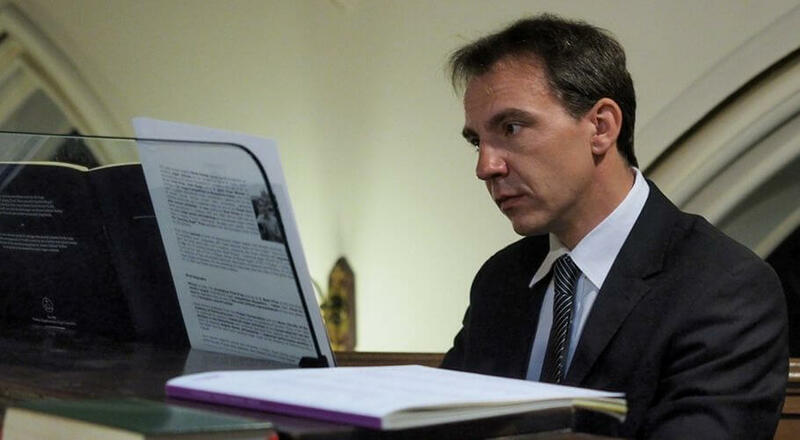 Pavel Kohout teaches in form of international master-classes and lectures worldwide, act as competition juror, cooperates with Czech National Radio on the project “Historical Organs” and other world radio and tv stations, preparing new music editions and recording on CDs. His CD records including the oldest Prague´ s historical organ (Mundt 1673) in the Church of Our Lady of Tyn in Prague, Katzer & Weltzel organ (1738) in Prague´s Loreto, a CD collection of tree remarkable historical instruments of Bohemia and Moravia, CD of Baroque organs of Slovenia. On his recordings he dedicated also two titles to the genial music of J. S. Bach and North German organ masters.